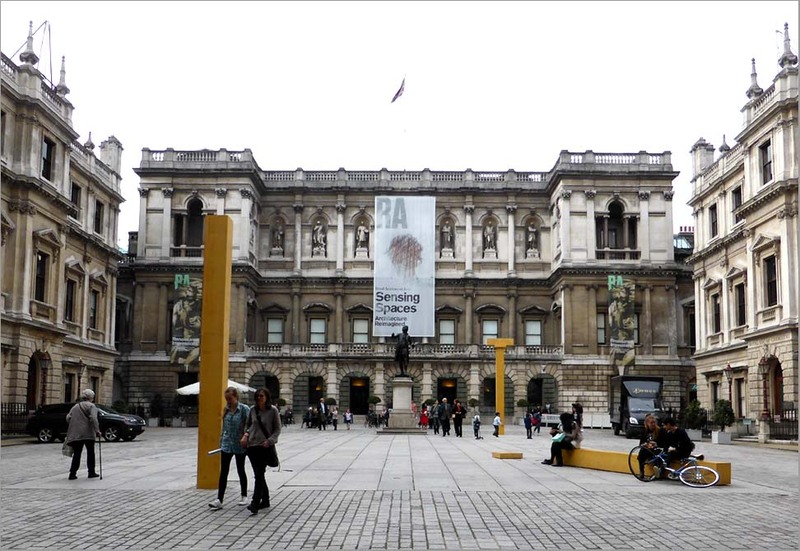 On Tuesday of this week (April 2nd) I went to see the Sensing Spaces Exhibition at the Royal Academy in London. 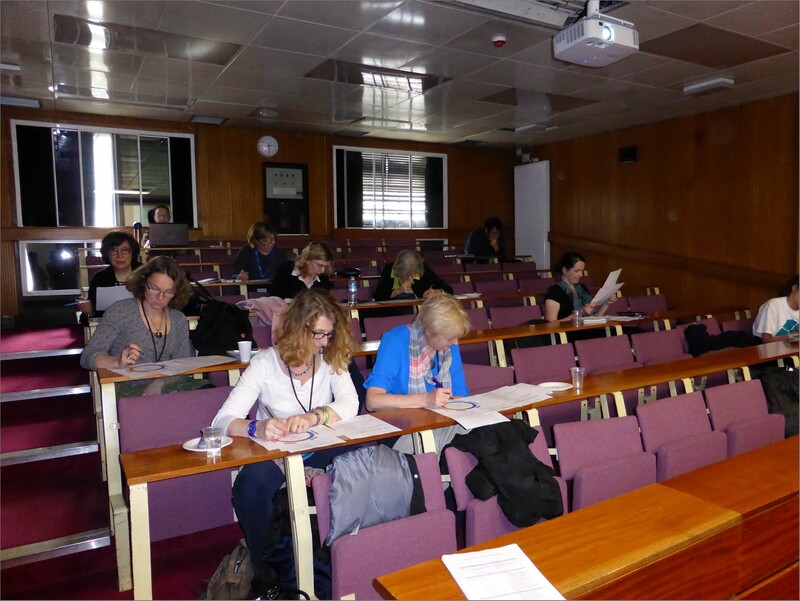 On the next day (April 3rd 2014) I attended a one-day conference at UCL in London and ran a workshop with my colleague, Elpida Makriyannis, in the space that you can see in this photo below. If you put students into a certain kind of space they will expect to be fed. If you put them in another kind of space they will expect to be challenged. Space prepares you to receive or to respond. The aim of the Royal Academy Sensing Space exhibition was that it would ‘radically transform the apparently dominant character of the classically planned and detailed interiors; transformation that will simultaneously amplify and diminish, mask and frame, illuminate and shade, and reinforce and unbalance the familiar gallery experience.’ The exhibition wanted to help visitors re-imagine architecture – just as when we design learning spaces we hope that they will encourage learners to re-imagine learning. The exhibiting architects understand that the experience of space is a holistic and relational one. Light, temperature, smell, colour and texture all play their part. Learning should be a sensual and embodied experience. As learners we should be in control of our learning paths, following routes of personal and individual interest, moving from lows to highs, from vertical to horizontal, from light to dark, from quiet contemplative spaces to engaged interactive community spaces, through doorways that allow us to make connections between our past and present, between outside and inside and take us consciously or unconsciously over learning thresholds. The learning space should be adaptive and allow us glimpses of as yet unreached vistas that fire our imaginations. It should be experienced from within, not externally imposed. In his keynote presentation to the UCL conference, Etienne Wenger said that learners in the 21st century need to be able to work in a landscape of practices, with engagement, alignment and imagination. 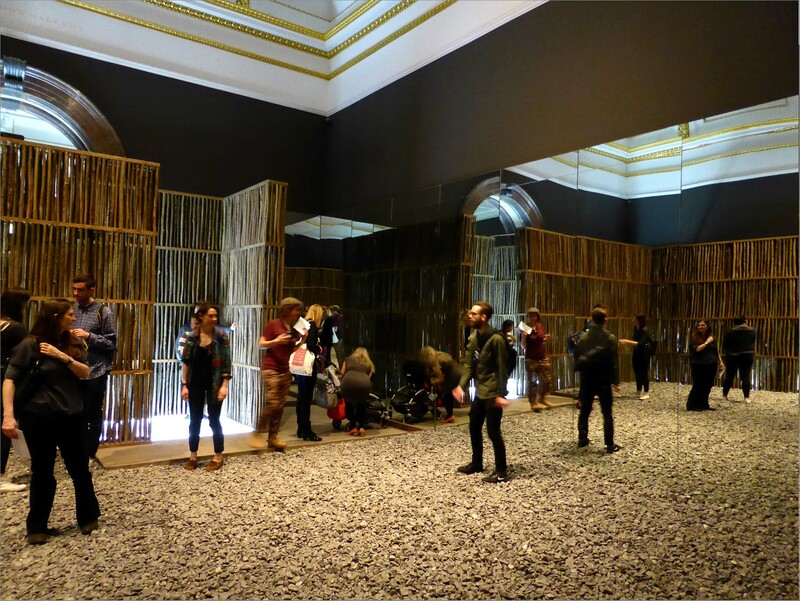 The Sensing Spaces exhibition was for me an experience of a landscape of different spaces, where I could envisage different practices emerging through engagement, alignment and imagination. 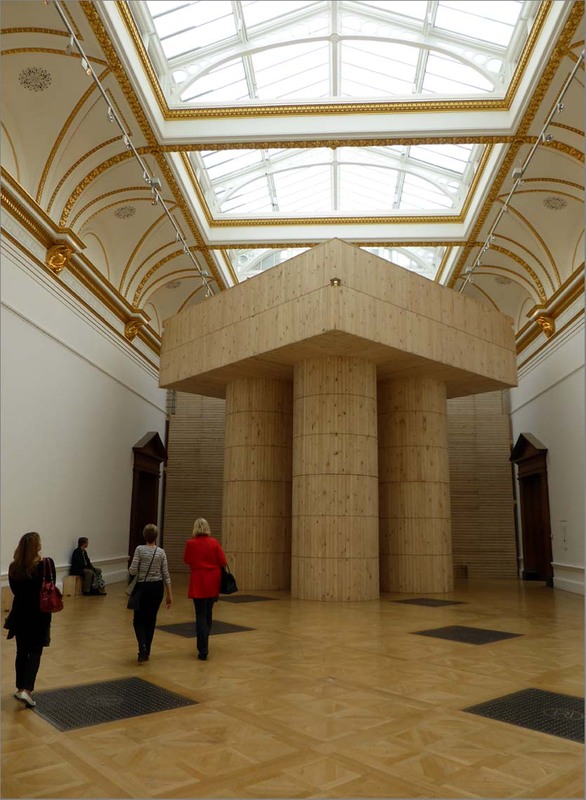 The Royal Academy published a very helpful education guide for the exhibition (Sensing Spaces education guide). I have quoted liberally from this in what follows, to show how each of the architects ‘spoke’ to me, not only about space and architecture, but also about the kinds of learning spaces I would like for my own learning. 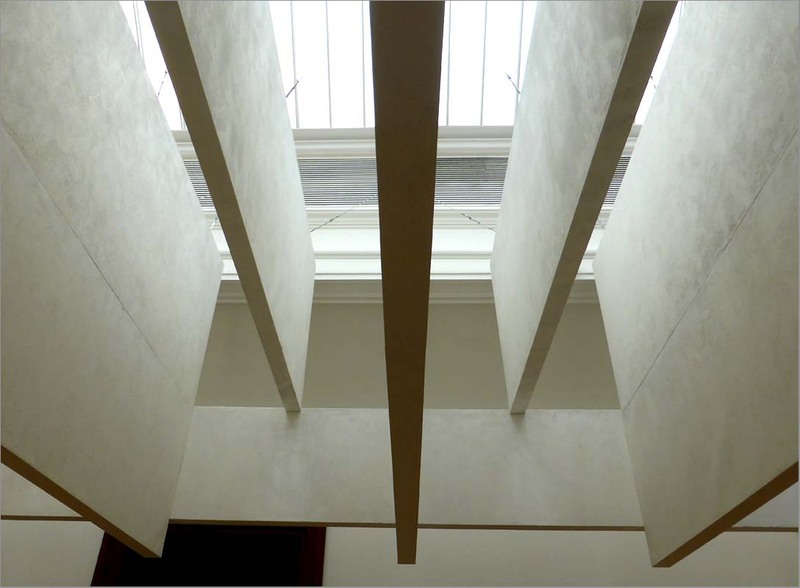 Siza’s installation is the first you see when arriving at the Royal Academy. 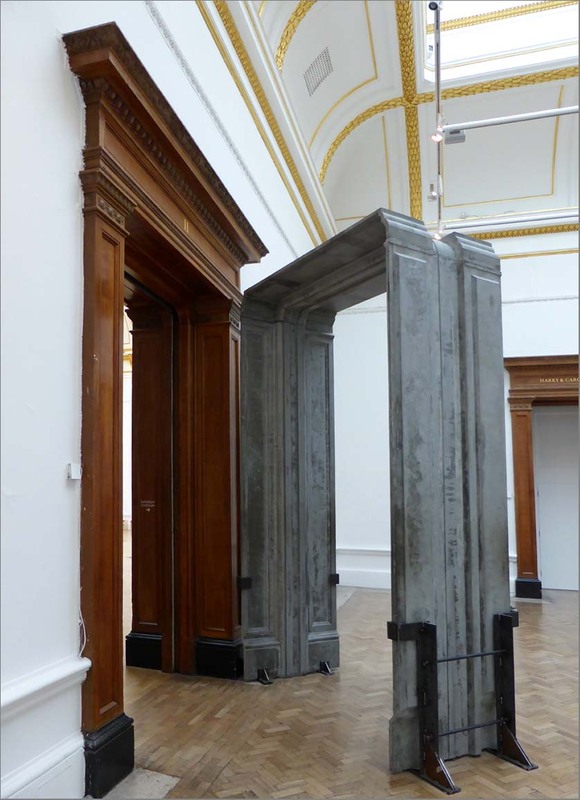 The installation is of three columns located outside the Gallery, which connect the outside with the inside. They reflect his interest in continuity, both the theoretical continuity of architectural history and the physical continuity of place. His work is based on a deep emotional response to the site. ‘…… we are always building in relation to something else. What we create is not an isolated object but transforms and is transformed by what exists’. There is no set route for viewing the installations. You enter an octagonal room, which is a central pivotal space to which you can return as you create your own pathway through the galleries. From the octagonal space the route I chose was to first go through Eduardo Souto de Moura’s door. 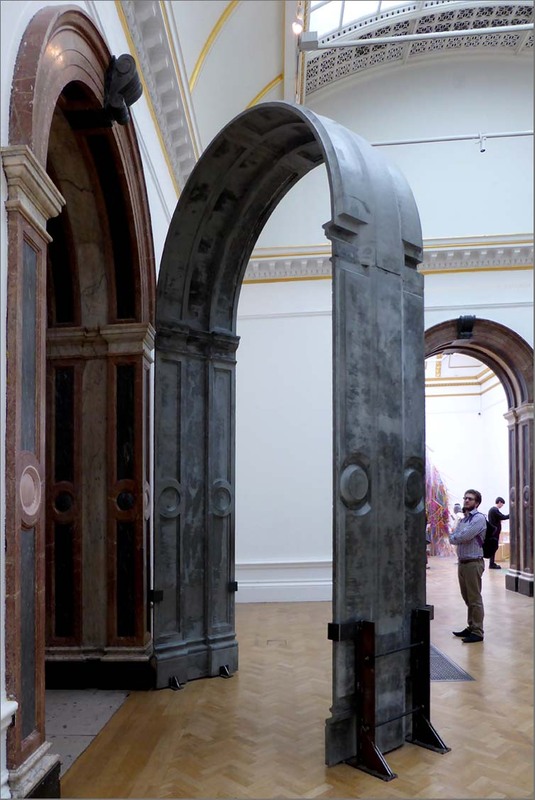 De Moura created two replica door cases – precise facsimiles of those in the Royal Academy and placed the copies at 45-degree angles to the originals. De Moura’s installations make passing through an aperture a more present experience – an experience of movement and transition. ‘It is not possible for an architect to design a space – such a concept does not exist. Instead, we design the thresholds and the limits: the walls, doors, and so on. I’m interested in designing the elements that give the impression of space’. ‘Good architecture is often invisible, but it allows whatever is happening in that space to be the best experience possible’. I don’t only interpret this in terms of physical space, e.g. the rooms/spaces that UCL or any learning designer might design, but also the opportunities for ‘internal’ spaces that are personal and individual to each student. Moving through de Moura’s doorway I came to an interactive community space. This was a room within a room, made of honeycomb plastic panels, and designed as an interactive and adaptive space, which relied on the engagement and contribution of the gallery visitor. 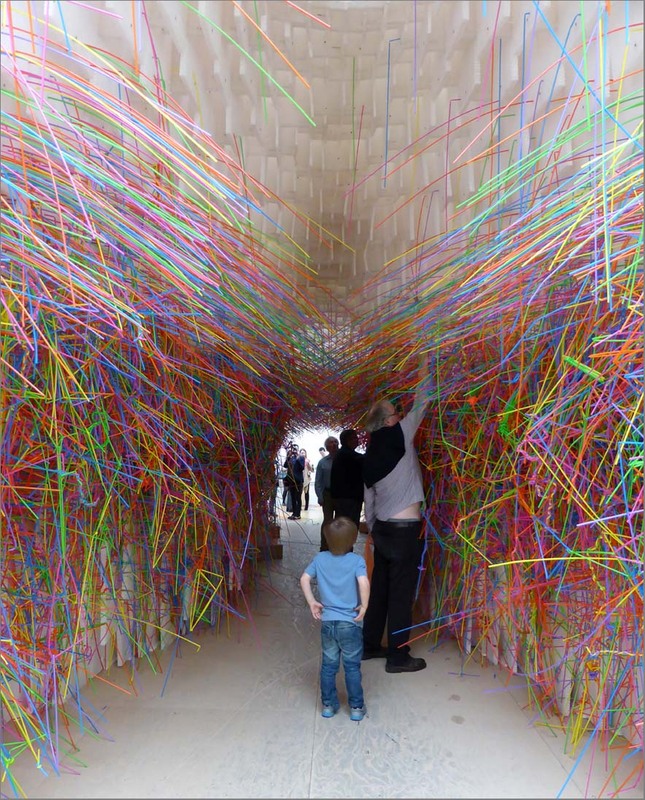 Visitors were offered brightly coloured plastic straws to thread through the holes in the honeycomb structure. Kéré states that his main aim is ‘ to create comfortable spaces for informal gatherings, and to help communities build their own inspiration’. For Kéré space, and learning in that space, is social and collaborative. In the next space the architects took us to places and spaces that we would not normally be able to visit or reach. They took us into the roof space of the immensely lofty rooms of the Royal Academy. …. I entered a contemplative space. Here the influence of space on the visitor/learner was so apparent. You could have heard a pin drop. If anyone talked at all, it was in whispers and hushed tones. 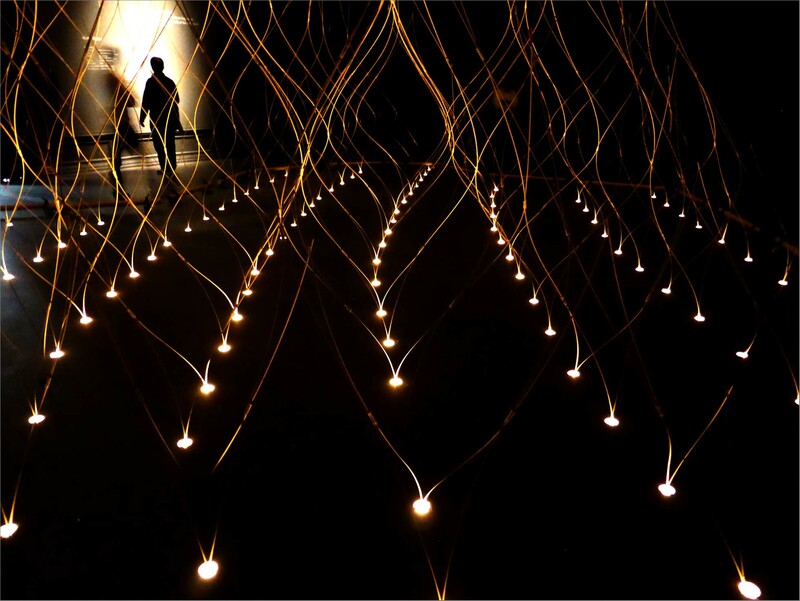 Kuma created two delicate installations made of lengths of bamboo whittled to a diameter of 4 mm, bound together to form a fragile structure, impregnated with liquid scent of Japanese Cyprus or Tatami and lit by LED light fittings in the floor. Kuma’s aim is to ‘achieve the maximum effect with the minimum use of resources’. What I took away from Kengo Kuma is that ‘less is more’, which immediately I related to less curriculum could be more learning, less resources could be more inquiry, less teaching could be more discovery and so on. 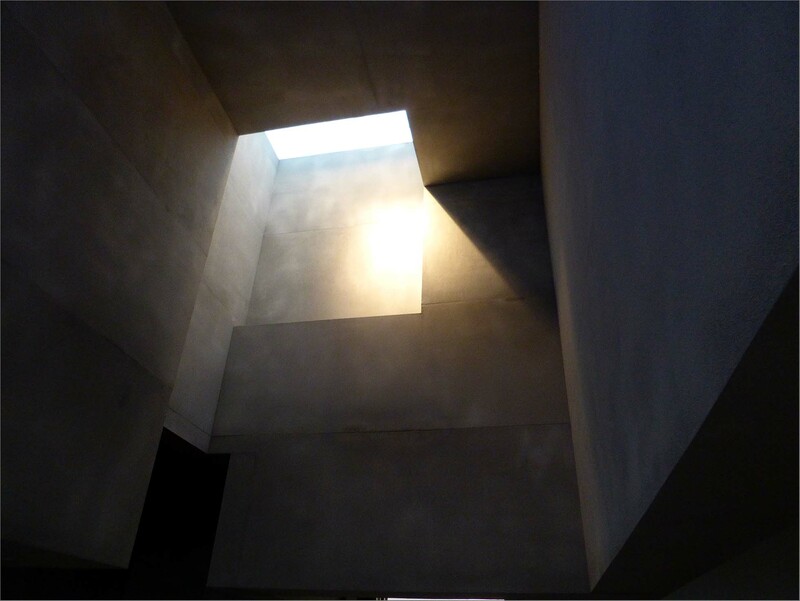 The Grafton Architects also created a quiet space in their dark space. People also whispered in this space. I can certainly recognize learning in terms of dark and light. Finally I moved into Li Xiaodong’s maze, where I could create my own journey to the Zen Garden. According to the ancient Chinese Philosopher Lao Zi, what is important is what is contained, not the container. Chinese architecture develops from the idea that the building is something to be experienced from within. Li Xiaodong’s installation ‘ adds a new maze of spaces to an otherwise familiar route’. 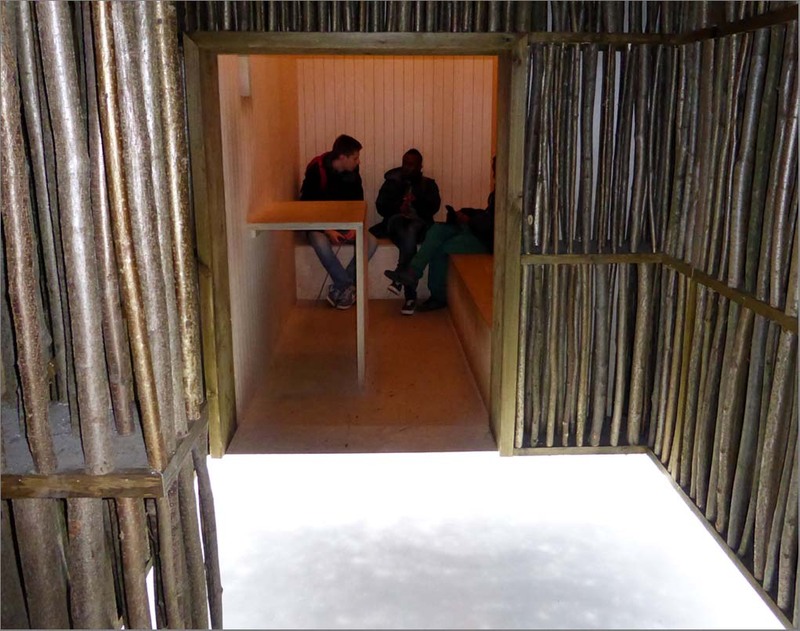 The timber frame is infilled with small sections of coppiced timber and placed on an acrylic floor lit by LEDs. The route through the maze culminates in a Zen Garden. Li Xiaodong states that there is a ‘fundamental difference between “being present” in a space, where you are absorbed within it, and looking at images of a space, where the mind is detached’. Xiaodong’s work seems to me to be all about identity, which comes full circle to Etienne Wenger’s keynote for the UCL conference in which he said that ‘The 21st century will be the century of identity’. It is interesting to think about the implications of the design of learning spaces for this.